Today we’re going to talk about hive equipment. We’re going to talk about the wooden ware required to start your own hive, what’s recommended and what is needed, and some of the different things that you can do to get your honeybees started. To start with, I want to point you to a couple of different websites that provide this kind of equipment. And there are likely local beekeeper shops near you. 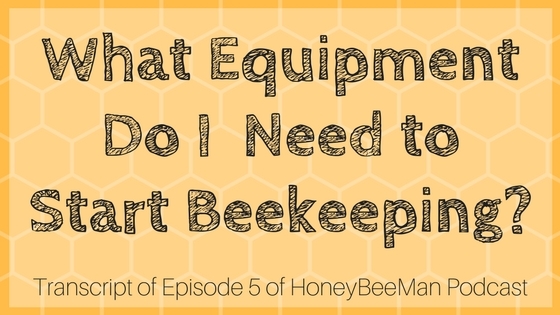 There seem to be lots of these companies around and I’m sure there is one in your state that you could purchase your beekeeping equipment from. If you know a beekeeper, you might even be able to pick up some of this stuff used for a whole lot less money. First of all, you have to have a hive stand. This is what the beehive sits on top of. The hive stand can be made out of practically anything. It could be as simple and inexpensive as a pallet, like a 4×4 pallet that they use for shipping items on a semi. You often can find these laying out behind a factory and sometimes they’ll give them to you free and they’re happy to get rid of them, other times they recycle these. You don’t want to get yourself in trouble taking one, but I’m sure everybody can find one if they look around long enough. That’s the simplest of hive stands. You could actually build your own. What I use for a hive stand is I take four concrete blocks and lay those on the ground, and then I take two landscaping timbers and I string the landscaping timbers across the four concrete blocks. I space those two landscaping timbers about 18 inches apart so that a beehive bottom board will set across the front and back landscape timbers. This is not required. You can really set a beehive anywhere that you want. You just don’t want to set it directly on the ground. It’s better to get it up off the ground so that the skunks and raccoons don’t decide to make a meal out of your bees. If you can get the hive off the ground, it just keeps it out of the weeds, keeps it out of the grass. It’s nice to have the hives 8 to 10 inches off the ground. It would be ideal if you could have it a foot off the ground. What I do is the eight inch concrete blocks, two landscaping timbers gives me about another three inches, and then the bottom board sits on top of that. I can put three hives next to each other on one of these set ups. Two landscaping timbers, they’re about $4.00 apiece, and then the concrete blocks are about $1.50 apiece, and there you have a hive stand. That’s what I use. You can use anything you want. If you have an old trailer, you could even set a hive on an old trailer. It really doesn’t matter, you really just want to get it up off the ground where the weeds won’t be interfering. Next, we put a bottom board on. I set my bottom boards directly on top of the landscaping timbers. There’s no need to fasten the bottom board down, you just need to set it in a level and secure location. The bottom board is going to have a lot of weight on it when the hive is full, so you need to make sure that it’s not rocking around and you need to make sure that it’s not where it could get flooded, that type of thing. The bottom board is typically made out of pine or sometimes plywood. Nowadays, a lot of people are going to screened bottom boards. A screened bottom board allows airflow into the hive. Often the screened bottom board will have a sliding piece of wood, or cardboard, or you could even use some foam core board to block off the air into the hive. Most people are going to these screened bottom boards now. They allow the moisture to flow into and out of the hive, so it allows better ventilation for the hive. I’ve found that not everybody is closing off the hive completely in the wintertime. Some people leave vent holes in the bottom board where they slide in the cover. It really depends on your management technique, whether you want the screened bottom board to be wide open, what your climate is, etcetera. In the summertime you definitely want ventilation for the hive, so the screened bottom board can be very important. The next thing we need would be a deep brood chamber. This is also commonly called simply a deep. Sometimes also called a hive body. A typical hive would have two hive bodies. Each hive body is approximately 16 x 20 inches, a rectangle. The front of this hive is about 16 inches wide and about 20 inches deep. The hive body usually has 10 frames inside each box. There are exceptions to this, but I’m just giving you the basics. A lot of guys will have different set ups. The standard set up is a hive body and the one on the bottom is called a deep. The reason it’s “deep” is because this is the brood chamber where the bees typically will make their nest, this is where they raise their young. A typical hive that is a good healthy strong hive will have two boxes setting on top of each other, each with 10 frames inside. These are the hive bodies, so you’ll have two of these. This is where the bees raise their young. That’s two deeps. A weak hive or a brand new hive would only have one deep. A very strong hive would have two deeps full of bees and this would be the brood nest. The queen stays in this area and that’s where she raises her young and that’s where all of the workers raise and maintain the brood. The brood is the baby bees or larvae and they’re raised in the bottom half of the hive in “the deeps”. The deeps are about 9 inches high and the boxes have 10 frames inside. The frames can be made out of wood, they can be made out of plastic, or a combination of materials. If they’re made out of wood, you would need a foundation. The foundation would either be made out of plastic or wax. The foundation is a very thin piece of frame with a honeycomb pattern on it, this is what the bees draw out. They put wax on it in the honeycomb shape and this is what they draw out. In the bottom boxes this would be a brood chamber they would raise the young in those little cells. Each little cell would have larvae in it and that larvae would be capped over, the young bees would eventually emerge as fully grown bees out of those cells. That’s the frame. It can be wood and wax, or wood and plastic, or can be all plastic. The price on the different configurations for these frames is about the same for plastic versus wood, wax it depends on what you prefer as a beekeeper and what you want to use. I personally use the plastic frames, the Pierco frames. A lot of beekeepers don’t like the plastic. I personally believe that there are some advantages to the plastic frames in just maintenance and upkeep, and the price being about the same I decided to go with plastic, but there are probably some advantages for wood and wax as well. That’s really a personal choice. I would suggest that if you’re just getting into bees you might try both and decide for yourself what you like. Maybe poll your local beekeepers and see what kind of consensus you come up with. If you buy a hive from another beekeeper, you’re probably going to have part of that decision made for you. A lot of guys are running wood and wax, so I wouldn’t be surprised if you saw some wood and wax in that case. Anyway, that’s the frames and we’ve talked about the deep. On top of the deep you have either a shallow or a medium. The only difference between the deep hive body and the shallow or the medium is the height. The width and the length are exactly the same, it’s just the thickness changes. A full honey super weighs a lot. If it was a deep it would be so heavy that even a young guy couldn’t lift it if it was full of honey without great bodily harm.The mediums and the shallows allow beekeepers who don’t want to hurt their back to lift these honey supers full of honey off of the hive to take back to the extraction house and extract that honey off. That’s the only reason that they’re thinner is so that you can lift them, because a full honey super (even a medium) weighs quite a bit and it’s very difficult to lift. That’s the only difference. Hive boxes don’t have tops and bottoms, so all of these hive components just stack on top of each other. As far as honey supers, you don’t give the bees the supers until they need them. For example, throughout the winter you typically would not have honey supers on, because the bees don’t need to put the honey in the hive in the wintertime because there is no nectar in the wintertime. You only give them honey supers when they need the space. I almost forgot to mention queen excluders. You don’t want your queen to come up inside of the honey chambers and put brood (or baby bees) in with the honey, because then when you try to extract your honey you’re going to have a mes. You can’t have brood in with your honey or that’s a very bad situation. On top of the deep boxes, before you put the honey supers on, you’ll have a queen excluder. It’s either a plastic or metal block and it has holes small enough that the worker bees can pass through, but the queen is bigger and she cannot get through the holes. That’s all that does. In addition to the honey supers we have an inner cover. The inner cover has a ventilation hole. The main purpose of the inner cover is it gives the hive ventilation and it also allows the cover to be lifted off of the hive without it being propolized down to the honey supers. If you’ve ever had a hive without an inner cover, your telescoping cover that goes over top of the entire hive to keep the rain out will get glued directly to the honey supers and it’s practically impossible to get it off. So the inner cover can be very beneficial. I prefer to run without an inner cover and what I do is I run a vented top. This vented top replaces the inner cover and it is just a wooden frame that is 4.5 inches high, it’s the same dimensions the 16×20 that the hive is, and the inner cover has four holes on both sides and three holes on the front and rear. These holes are drilled at an angle so that when the rain hits them the rain will come away from the hive, it won’t run into the hive if it hits the side walls. The purpose of this ventilation cover is that it ventilates the top of the hive. So if you have a screened bottom board and you have a top cover, the air can circulate through that hive without any trouble at all. Lastly, on top you have the top cover. There are very simple covers that are called migratory covers. These migratory covers are simply a piece of wood, sometimes covered with tin or metal and then on the front and back it has a rail nailed to it. They’re typically painted up to protect them. They cover the rain from coming in the hive. Those are very simple and they don’t even hang out over the sides, they just hang out over the front and back with a cleat nailed underneath. Very simple, very low cost. If you have a little more money, they make plastic hive covers that are pretty nice. They’re very solid thick plastic, probably three-eights of an inch thick. Those are very solid and I like those a lot. They’re a little bit costly, but they are really nice. They’re nice to bring your honey back to the extraction house as well, because you can actually cover the top and bottom of the honey supers with those. If you have some extras laying around, those are really nice to have for that too, it keeps your pickup truck from getting honey and wax all over the bed of the truck. That’s a pretty nice thing. Then you could also have a telescoping cover that covers all the way around the outside. It’s slightly bigger than the box, it goes down over the top of the very top box on the hive stack and keeps the rain and wind out. The very last item that I have to mention is a brick, a rock, a concrete block, or something heavy to set on top of each hive to keep the varmints out and keep the lid from blowing off, and basically to hold the whole hive together. I use concrete blocks that are either broken in half or a half-size block that you can buy, or whatever I can find. If I can find a couple of bricks, I’ll put a couple of bricks on top of the hive. it just keeps the wind from blowing it over, it gives the hive a little bit of weight so that it won’t get blown over or tipped over and so forth. That’s about it as far as the actual hive equipment. Additional tools you’ll want to have were mentioned in Introduction to Beekeeping; a veil, gloves, a bee suit, and a hive tool.